Reading, scientific and mathematical literacies are considered essential for full participation in the modern ‘knowledge societies’ (OECD, 2009). And of the three literacies, reading literacy is considered especially important as it forms the ‘bed-rock’ on which other forms of literacies are formed. Scientific research on ‘reading education’, thus, expectedly, has had a long history in developed nations; and in the United States, in particular, the government has spent millions of dollars in funding reading literacy-related research since the 1960s. The author of Situated Language and Learning, James Paul Gee, is an important scholars of ‘New Literacy Studies’ – an interdisciplinary field which studies language, learning, and literacy in an integrated way, in their cognitive, social, and cultural contexts (ASU). His current research interests are in the role language plays in learning; video games designs and how they support learning by incorporating effective learning principles; and what schools and education systems can learn from video games to meet the pressing challenges (of effectiveness and equity)faced by them. The book, as Gee notes in the Introductory chapter, is “one argument” (Ch1, p. 2), broken into six chapters, which can be summarized as follows. What’s hard for children is not learning to read but learning to read and learn “academic contet” such as mathematics, science and social studies. This is because each content area (or subjects) is written in a “specialist variety of language and symbols” which is markedly different from the everyday (or vernacular) language used by children (Ch2, p. 15-17). Children from privileged families, by virtue of the fact that their parents/care-givers are familiar with, and understand the importance of academic language, get a crucial ‘head-start’ before school; and also continue to receive support at home after they have joined school. Most schools, however, are barely even aware that academic varieties of language exist and that they have to be ‘especially’ learnt by young children. Instead, they focus largely on ‘phonemic awareness’ training. This, Gee argues, leads to the “fourth grade slump” (Ch3, p. 38, 41) (a phenomenon in which children who ‘seem’ to be able to read in early grades are unable to comprehend texts of fourth and higher grades). He gives examples of Pokémon (a video-game based media franchise comprising of fictional characters such as ‘Charmander’ and ‘Charizard’) to show how children from even non-privileged backgrounds are able to easily master the highly complex ‘specialist language’ of the game; and uses this to argue that “human mind works best when it can build and run simulations of experiences its owner has had – like playing a video game in the mind” (Ch4). Since, learning to read and learning content can never really be separated (Ch 4, p. 35), people learn specialist language as well as the content and related “ways of thinking” (say, as a physicist or geographer or in case of video-games as an ‘alien’ or a ‘sharp-shooter’) “when they can tie the words and structures of those languages to experiences they have had.” (Ch. 4) In other words, learning (to read) works best as a cultural process and not as an instructed process (Ch. 4, p. 35). Gee then considers an example of a video game (Rise of Nations) in detail, to show how these games “exemplify good learning principles in particularly striking way” (Ch. 5, p. 52). Since (a) they are essentially simulation of experiences and new worlds (similar to ‘mental simulations’ we run in our heads); (b) the very survival of companies producing these games depends on the ‘learners’ continuing to want to play these games (voluntarily), and (c) people from “all races and classes readily learn specialist varieties of language, content, and ways of thinking without feeling ‘alienated’”, Gee argues that video games can teach us how to make learning of specialist/academic varieties of language and content in schools “more equitable, less alienating and more motivating” (p. 4). Gee has consciously sought to avoid (p. 2), and succeeds in avoiding unnecessary ‘academese’ even when discussing fairly specialized topics. It is well written, eloquent, coherent and easily accessible even to someone with no prior knowledge of language learning or video-games. Secondly, Situated Language and Learning is highly though-provoking – how many of us, for instance, (or how often) have we seriously considered that video-games can be extremely useful – not just in language teaching/learning but almost all types of ‘learning’? Or how often have we looked to leverage the inherent desire in a learner to acquire an ‘identity’ in his larger cultural group (p. 42, p. 88); or the use of ‘affinity spaces’ (p. 70), to make the learning more effective? Though the book was originally published years ago, many of the ideas are still fairly novel and stimulating. And this brings us to the third ‘strength’ of the book, or rather of its author – it is clear that Gee has spent perhaps hundreds of hours (personally) playing the video games which he mentions. (How many ‘serious’/’academic’ professors of linguistics would one expect to do so?) And this, combined with his formal training in linguistics and decades of previous research experience in discourse analysis, positions him uniquely to write on this topic; with insight and authority. Further, the book not merely ‘suggests’ but actually ‘shows’ how and why video games can be useful in education. His description of how video games use effectives principles of learning theory (25 of them! ), in Ch. 5, is extremely detailed and useful from an educators perspective. Similarly, the contrasts that he draws between online ‘affinity spaces’ and traditional classrooms, helps one clearly see how classroom environments can be improved using the gaming model. However, it has its fair share of limitations. Its greatest shortcoming, perhaps, is that it relies on rather limited empirical data (many of the claims, in fact, are based on one or a few ‘case studies’, see, for example, p. 18 -29, p. 53) which makes it difficult to draw generalizable ‘conclusions’ from it. Even where it is implied that conclusions/claims are supported by empirical evidence, the details are not easily forthcoming/available (for example, p. 7-8, p. 107). Secondly, unlike as in the US, video-games’ use in developing countries is still extremely low and is largely confined to the children of the middle and upper-middle class, urban/semi-urban families. It is thus difficult to say at this point, whether and to what extent Gee’s claim of videogames making education “more equitable, less alienating and more motivating” will hold, in these (significantly different) contexts. And finally, parts of the discussion (see, for instance, p 86-88: ‘The old and the new capitalism’) contain rather poorly substantiated arguments and sweeping generalizations (p 107) which many are likely to find unconvincing. This book raises and/or discusses a number of points that would be of interest to educators. Personally, I have been interested in the area of ‘the acquisition of academic language by adult learners’ and it was interesting to see that one of the most important claims of this book is around the distinction between ‘academic’ and ‘vernacular’ language (detailed in Ch. 2). More importantly, the author has described a number of specific ‘characteristics’ of both forms of language which make them different. The author also discusses the ‘paradox’ of vocabulary acquisition (people with poor vocabularies are poor readers, and poor readers find it difficult to enhance their vocabulary; Ch. 4, p. 35; which I have had to deal with while designing content); and suggests a way to deal out of it. I also found the discussion on principles of learning theory (Ch. 5, (learning as ‘collaborative dance’ between teacher’s guidance and learner’s interpretations and actions, the use of scaffolding etc. summarised on p. 67-68) and how they are used in video-games to be extremely useful – something, which can be used in designing learning content. Situated Language and Learning offers new perspectives on the ‘problem’ of literacy and learning; introduces novel ideas; is thought-provoking; and easy to read. 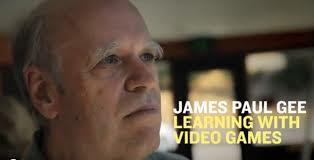 James Gee’s writing is eloquent and cogent and he is an expert on the subject of language, learning and video-games; and provides a number of practical advice on how to make learning more effective using video-games as a ‘model’. This book would be substantially useful to educators – I would recommend it especially to teachers, students of education, head-teachers/principals and content and curriculum designers. ‘Literacy’ has been defined differently for PISA by the OECD (as compared to its ‘usual’ meaning). Thus, there are a total of eight chapters, including the short introduction and conclusion chapters. It’s worth noting here that ‘reading’, to Gee, is not merely ‘pronouncing the words’ but ‘comprehending’ the text (more on this below). A contrast, perhaps, could be made with ‘Pedagogy of the Oppressed’ – a book of similar length, for a roughly-similar audience (of educators) which, as many have pointed out (see p. 20 for instance), is unusually complex.